Research carried out since the mid-1970"s has dramatically altered our ideas about the size and complexity of Preclassic lowland Maya centers. We now know that features such as formal ceremonialism, craft specialization, and urbanism were already well established during Preclassic times. In many instances however, these associations have been hard-won, as Preclassic materials were often deeply buried beneath later constructions (Ringle 1999:183). This was the case with the initial discovery of monumental architecture dating to the Late Preclassic at Uaxactún (Ricketson and Ricketson 1937) as well as with subsequent materials encountered beneath the North Acropolis at Tikal (W. R. Coe 1965). A few sites, namely Cerros (Robertson and Freidel 1986; Scarborough 1991), Cuello (Hammond 1991), Komchen (Andrews V and Ringle 1992), and El Mirador (Dahlin 1984; Matheny and Matheny 1990) were largely free of the overburden restricting insight into early patterns of community organization. Nonetheless, traditional models for the rise of lowland Maya civilization have arisen from decades of archaeological investigation at sites illustrating gradual evolutionary trajectories in which descriptions of Preclassic architecture and artifacts as "simpler", "formative", and "developmental" carried with them clear evolutionary implications (i.e. Smith 1937:3; Coe and Coe 1956:372). The work on the North Acropolis at Tikal was perhaps the first to challenge these notions as the farther down they excavated, "the elaborateness and Classic appearance of the discovered structures were no less apparent." In fact things got neither "simpler", nor "cruder", nor more "formative". (Coe and McGinn 1963:26) More recently, investigations in the "Mirador Basin" have revealed abundant Middle and Late Preclassic architectural remains and other manifestations of complex society. In fact some of the largest constructions in Mesoamerica come from this time and region (i.e. Hansen 1998). Settlement surveys at several sites have shown Late Preclassic occupations eclipsing Early and Late Classic densities. In addition, recent research has conveyed a greater appreciation for the sophistication and antiquity of early Maya ritual, deities and art (i.e. Laporte and Fialko 1990, 1995; Hammond, Clarke and Estrada Belli 1992; Hammond 1999, Ringle 1999, Fields 1991; Freidel 1990; Freidel and Schele 1988; Saturno et al. 2001; Saturno et al. n.d.). Nonetheless, biases persist, and evidence opposing traditional models can often be regarded as simply epiphenomenal. It is hard to consider El Mirador as representative. Its sheer enormity and rapid rise at once illustrate its exemplary nature and that it is unlike anything else we have found in the lowlands. It is a sample of one, and it is decidedly not average. The site of San Bartolo, by comparison appears more commonplace. It has only two or three truly monumental structures giving clear indication of a certain degree of complexity, yet the entire site could easily fit within the Danta Complex at El Mirador. 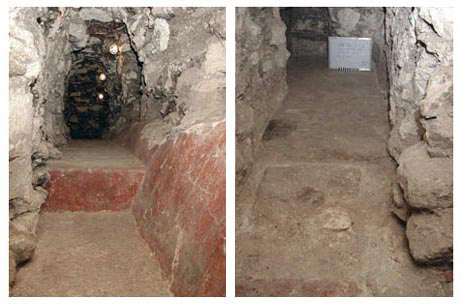 Despite its diminutive nature, San Bartolo in the Late Preclassic still possesses many of the characteristics one would expect to find at a large Classic Period center, specifically, a well differentiated residential hierarchy, clearly defined monumental ceremonial space that includes polychromatic narrative murals and painted hieroglyphic text. The project at San Bartolo is in a unique position to evaluate environmental, demographic, economic, and ritual factors in the development of complex society in the northeastern Petén during the Preclassic, and how changes in those factors may have contributed to the apparent Early Classic political reformulation in the region centered around Xultún and by extension throughout the Maya lowlands at that time. Until March of 2001, the ruins of San Bartolo were unknown to archaeologists, resulting in a number of structures suffering years of illicit excavation by looters during the last decade or more. More than 200 looters" trenches and tunnels have thus far been encountered at the site and much of our first two seasons of investigation have focused on salvaging some contextual information from them. The site, located in an uninhabited region of the northeastern part of the Department of Petén, Guatemala, Central America, covers an area of approximately 1 km2 and is comprised of more than 100 stone structures organized into two principle architectural groups (Figure 1). The larger of the two groups is associated with the pyramid, Str. #20, named Las Ventanas, "the windows", due to the preserved masonry windows in its final phase superstructure. The group consists of a large number of residential mounds, a "palace" structure, a large central plaza and a small ball court. In addition a causeway leads from the southern end of the central plaza and extends more than 200 meters toward a limestone quarry and an area of seasonal swamps to the south. 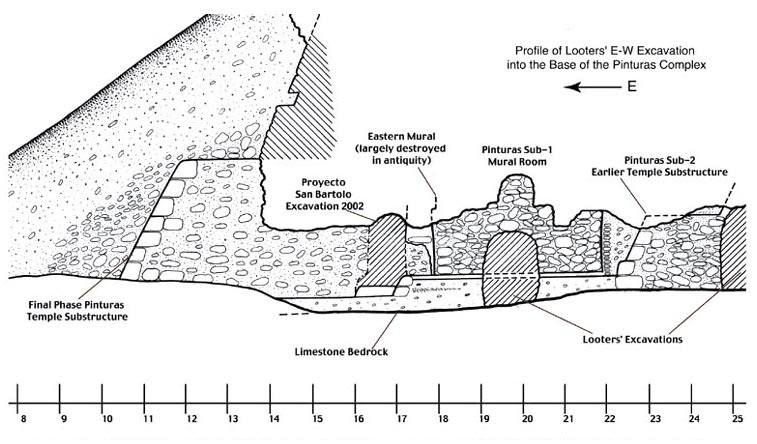 The looters" excavations in the main pyramid of Las Ventanas demonstrate a number of different construction phases. One tunnel near the structure"s summit traverses the building from south to north revealing four phases of Late Preclassic (400 B.C.-A.D. 200) well-preserved masonry and stucco architecture. A second tunnel at the structure"s base contains evidence of eight earlier stages of construction, the earliest of which date to the Middle Preclassic (ca. 800-400 B.C.) and were built with a loosely packed fill of flint nodules. During the 2002 season our team excavated small 50 x 50 x 50 cm probes into each successive phase visible in the looters" excavations as well as a 2 x 2 m test pit into the structure"s basal platform, uncovering an earlier version of the substructure again dating to the Middle Preclassic. A similar excavation was undertaken in the diminutive ball court located on the eastern boundary of the central plaza, again revealing multiple construction phases ranging in date from the Middle to Late Preclassic. During the survey and mapping of the site center, several stone monuments were found. Three heavily eroded fragmentary stelae were discovered in the central plaza while a fourth was encountered in the site"s periphery. Stela 3, the best preserved of the four at one point bore what is clearly a hieroglyphic inscription, though at this time it is largely illegible. The ceramic material associated with these monuments although heavily eroded can be dated to the Late Classic Period (A.D. 600-800) and would appear to signal the return of activity to the site center following a long hiatus. It is important to note that aside from the materials placed over the fallen stelae and the offering in Structure 63 discussed below, all of the material thus far recovered from excavations in the site center have been dated to the Preclassic. One looters" excavation revealed the presence of a carved boulder monument beneath Structure 63, located to the south of the palace. The monument was buried by a ceramic offering containing hundreds of smashed utilitarian vessels dating to the Late Classic. The ceramic deposit was then covered over by a small (approximately 2 meter) stone mound surmounted in antiquity by a perishable superstructure. This Late Classic activity in the site center in the form of ceramic offerings on existing stone monuments illustrates the enduring importance of the Preclassic center nearly 500 years after monumental construction at the site had ceased. The second architectural group, Las Pinturas, named after the paintings found within it, lies approximately 500 m to the east of Las Ventanas, facing west. The central structure, Str. #1, stands more than 26 meters high and is pierced by four looters" excavations, two in its face and two in its posterior. The principle looters" excavation (Figure 2) began as an axial trench of the final phase substructure, however after finding the preserved basal terrace they converted to tunneling. The East-West looters" tunnel continues for more than 40 meters to the west, occasionally branching to both north and south in a vain search for tombs. As our team did in Ventanas, we excavated small 50 x 50 x 50 cm units in each successive construction phase visible within the complex of tunnels. At present, six stages of construction are evident, all of which date through ceramic evidence to the Preclassic. The final building episode began sometime between 100 B.C. and A.D. 100, when the penultimate constructions in the group were filled in to make a stable base for Str. #1. It is this penultimate phase of construction, Pinturas Sub-1, that contains the polychrome narrative murals for which the site is now known. The murals of San Bartolo are in a remarkable state of preservation given their antiquity and the methods by which they were uncovered. 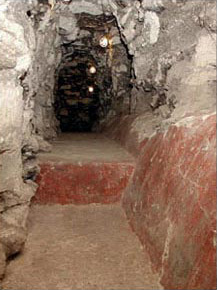 The looters removed the lower half of the northern wall of Pinturas Sub-1 in the process of their tunneling. The paintings are on the upper half of the same wall that now hangs suspended in mid-air by the densely packed fill that surrounds it. Gravity is clearly taking its toll as their surface is cracked and pieces are becoming detached. Conservation and analysis of the exposed mural has been of primary importance to the project to date (Figure 3, shown above). To this end, a team of conservators has been involved since the inception of research at the site. To date, the murals have been drawn and photographed and had all biological surface adhesions removed. In addition we have made use of multi-spectral digital photography to fully record the paintings, in both visible and non-visible spectra. The chemical and physical analysis of plasters and pigments is ongoing, as is the recording of microclimatic data from the interior and exterior of the mural room. The fragile borders of the mural have been edged with lime plaster and detached fragments re-adhered to their substrate. We have also constructed a temporary post and lintel support to replace the missing wall, thereby decreasing the danger of a catastrophic collapse. 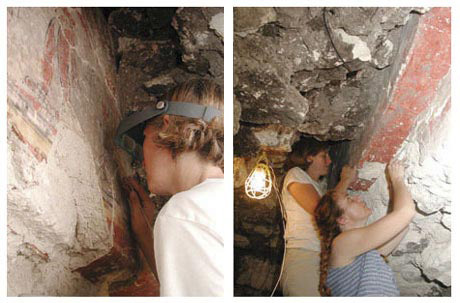 One of the objectives of the 2002 field season was to determine the overall dimensions of Pinturas Sub-1 and the murals within in order to plan for their future excavation and conservation. To this end, our team excavated a tunnel (Figure 4, shown above) along the exterior eastern wall of the structure, revealing the overall length of the basal platform of Pinturas Sub-1 as 11 meters. We discovered that the eastern wall had been destroyed in antiquity, though much of its mural is preserved in the interior fill of the room. 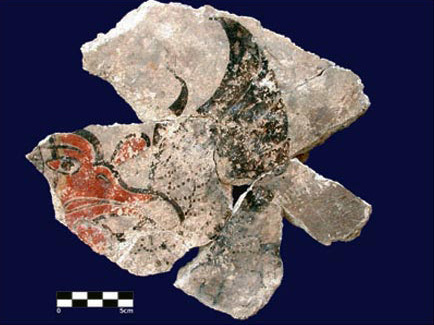 Our excavations recovered numerous portions of the mural that we have been able to reconstruct (Figures 5 and 6, shown below), including a calendric glyph (Figure 7, shown below) that was part of a longer inscription, representing the earliest example of a painted hieroglyphic script in the Maya Lowlands. Our 2002 season though relatively short was extremely rewarding and has effectively laid the foundation for the next four years of research and conservation to be carried out at the site and in the region. In future years, the mural will be fully excavated and consolidated, and the early construction phases in both the Pinturas and Ventanas complexes will be explored more fully. Our regional survey will expand to include the important Maya sites of Xultún, Xmacbatún, and La Honradez in the process of covering some 500 square kilometers of rainforest. This survey will be complemented by extensive excavation of residential architecture at San Bartolo and throughout the region, enabling us to accurately piece together the complex and important undulations of development and decline in the northeastern Petén, one of the last truly unexplored regions of the Maya area. Note: You may visit the San Bartolo.org website by clicking here. 1992 "Los Mayas Tempranos en Yucatán: Investigaciones Arqueológicas en Komchén." In Mayab 8:5-17. 1956 "Excavations at Nohoch Ek, British Honduras." In American Antiquity 21:370-382. 1963 "Tikal: The North Acropolis and an Early Tomb." In Expedition 5 (2):24-32. 1984 "A Colossus in Guatemala: The Preclassic Maya City of El Mirador." In Archaeology 37 (3):18-25. 1991 "The Iconographic Heritage of the Maya Jester God." In Sixth Palenque Round Table, 1986, pp. 167-174, Merle Greene Robertson and Virginia M. Fields, eds. Norman: University of Oklahoma Press. 1990 "The Jester God: The Beginning and End of a Maya Royal Symbol." In Vision and Revision in Maya Studies, pp. 67-76, Flora S. Clancy and Peter D. Harrision, eds. Albuquerque: University of New Mexico Press. 1988 "Symbol and Power: A History of the Lowland Maya Cosmogram." 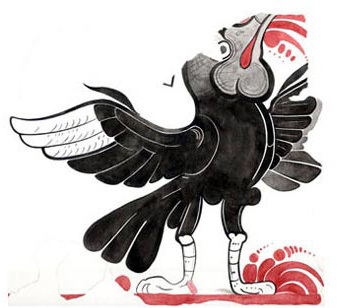 In Maya Iconography, pp. 44-93, Elizabeth P. Benson and Gillett G. Griffin, eds. Princeton: Princeton University Press. 1992 "Middle Preclassic Maya Buildings and Burials at Cuello, Belize." In Antiquity 66:955-964. 1998 "Continuity and Disjunction: The Pre-Classic Antecedents of Classic Maya Architecture." In Function and Meaning in Classic Maya Architecture, pp. 49-122, Stephen Houston, ed. Washington, DC: Dumbarton Oaks research Library and Collection. Laporte, Juan Pedro, and Vilma Fialko C.
1990 "New Perspectives on Old Problems: Dynastic References for the Early Classic at Tikal." In Vision and Revision in Maya Studies, pp. 33-66, Flora S. Clancy and Peter D. Harrision, eds. Albuquerque: University of New Mexico Press. 1937 Uaxactun, Guatemala. Carnegie Institution of Washington, Publication 477. Washington DC: Carnegie Institution of Washington. 1999 "Pre-Classic Cityscapes: Ritual Politics among the Early Lowland Maya." In Social Patterns in Pre-Classic Mesoamerica, pp. 183-223, Rosemary Joyce and David C. Grove, eds. Washington, DC: Dumbarton Oaks Research Library and Collection. 1986 Archaeology at Cerros, Belize, Central America, vol. 1: An Interim Report. Southern Methodist University Press, Dallas. 2001 Reconocimiento Arqueológico y Conservación de San Bartolo, Guatemala. Instituto de Antropología e Historia, Guatemala. 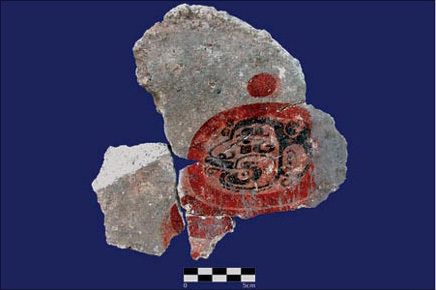 n.d. "Preclassic Wall Painting at San Bartolo, Petén Guatemala." Submitted to Antiquity. Anticipated publication March 2003. 1991 The Settlement System in a Late Preclassic Maya Community. Archaeology at Cerros, Belize, Central America III, David Freidel, series ed. Dallas: Southern Methodist University Press. 1937 "A Study of Structure A-I Complex at Uaxactun, Petén, Guatemala." In Contributions to American Archaeology, no. 19, Publication 456:189-231. Carnegie Institution, Washington, D.C. The Rise and Fall of Maya Civilization. Norman: University of Oklahoma Press. In March, 2001, fieldwork by the Peabody Museum"s Corpus of Maya Hieroglyphic inscriptions Program led to the discovery of extraordinary ancient Maya wall paintings at the remote ruins of San Bartolo, El Petén, Guatemala. The early date of the murals—ca. A.D. 100 by their style—establishes them among the most important finds in Maya archaeology the last few decades. William Saturno, working at the time as assistant to the Corpus project, came upon San Bartolo when led there by local guides, walking through a very remote and forested region of northeastern Guatemala. The guides had informed him of carved monuments, but upon arrival none were found. Before returning, and short on water, he investigated a large pyramid vandalized by a recent looter"s trench and tunnel. Within the trench, he found vestiges of an older structure, covered by later construction. The vandals had exposed part of a room; the one visible wall bore a colorful mural painting. The quality of the paintings is truly remarkable, but even more important is the early date; these look to have been painted ca. A.D 100–200—several centuries before any other Maya mural (the famous Bonampak murals date to the late eighth century). Soon after their discovery and reporting of the paintings, preparations were made for their protection and further investigation. The National Institute of Anthropology and History of Guatemala approved these endeavors, and two guards were employed to reside near the ruins. With the support of the Peabody Musuem and the Committee for Research and Exploration of the National Geographic Society, a small expedition was mounted in order to assess the condition of the paintings and the prospects for a more extensive excavation project. The following June, the small party spent six days at the ruins photographing the remaining paintings, exploring the extensive ruins, and beginning preliminary technical studies of the plaster and pigments. These investigations have confirmed the early date of the paintings, and significantly all ceramics associated with the pyramid date to the Late Pre-Classic period (200 B.C.– A.D. 200). The San Bartolo murals are probably the earliest extensive Maya wall paintings ever found. The looters exposed the 1.5 meter-wide area we see today, and remarkably they did not attempt to remove the paintings (the vandals may have appreciated their fragile condition, and opted to leave them for the time being). The exposed wall represents one side wall of a rectangular room, over four meters in width. Although the original extent of the paintings remains unknown, there is little doubt that they continue on the other walls of the structure. Clearly, then, most of the mural remains covered by the fill of the pyramid, awaiting excavation. Enough is visible to allow for a partial interpretation of the complex imagery, which seems to be mythological in subject. Nine different figures are visible—most only partially—all standing or kneeling above a complex border decorated with geometric designs. This is probably an archaic form of the Maya "sky band" found throughout later Maya art of the Classic period. The principal standing figure is the bejeweled Maize God whose distinctive head shape replicates, albeit stylistically, the foliation of the corn plant (Figure 2). Arms outstretched, his hands seem to hold an object still hidden by the fill of the tunnel. The Maize God has turned his head and looks over his shoulder at the woman kneeling behind him, who in turn has her arms upraised (Figure 3). Another female figure with flowing black hair "floats" above her. In front of the Maize God is a somewhat obscure figure of a kneeling man, painted black, and other figures seem to be arranged in a procession-like line at left. Representations of the Maize God with scantly clad women are well known from the mythological art of the Late Classic period, but no examples of such an early date have ever been found before now. Indeed, it is fair to say that no narrative mythological scene of such antiquity has ever been found in the Maya area. 3. 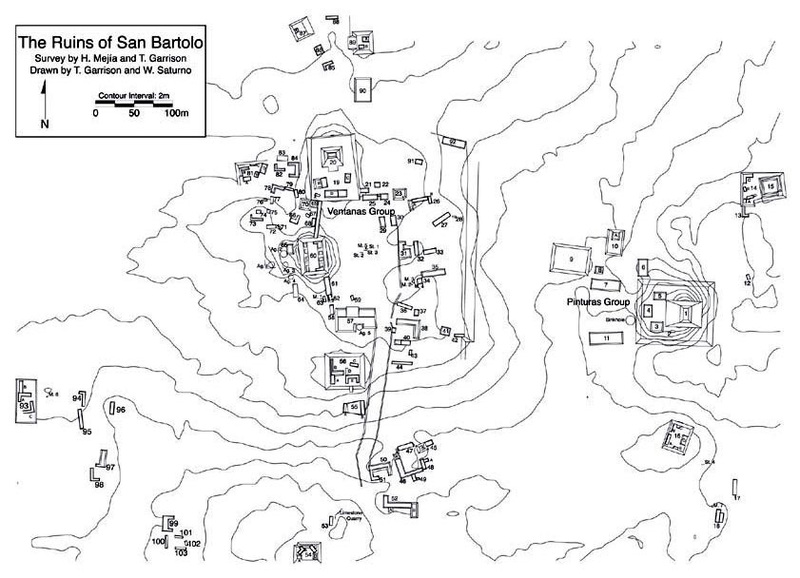 A preliminary survey and mapping of the ruins of San Bartolo, focusing on its two main architectural groups. The excavation of the paintings themselves, located as they are within a large pyramidal structure, will be a logistical challenge, but surely a rewarding enterprise once more of this remarkable mural is exposed. In summary, the murals at San Bartolo are potentially one of the most significant finds in Maya archaeology in the last several decades. All material copyright © 2000 President and Fellows of Harvard College, all rights reserved; please contact us or read "A Note to Web Managers" for questions, comments, etc. Guatemala, 13 de diciembre. Enterrado en un profundo túnel de la selva de Guatemala, arqueólogos descubrieron la parte final, la más elaborada y más hermosa de un mural maya de más de 2 mil años de antigüedad, comparado por su descubridor con la Capilla Sixtina. El arqueólogo William Saturno, de la Universidad de New Hampshire, encontró en 2001 el principio del mural en las ruinas de la ciudad de San Bartolo (departamento de Petén, al norte), pero este año encontró "la joya de la corona". El muro demuestra que los antiguos mayas, conocidos por sus progresos en astronomía y matemáticas, emplearon los mismos ritos de coronación por unos 800 años. La pared oeste del cuarto subterráneo, que data del año 100 aC, retrata el mito de la creación maya y la coronación de un rey, con más colores, así como con una pintura más fina y elaborada que en los trabajos conocidos hasta ahora. "Fue como descubrir la Capilla Sixtina, si no supieras que existió el Renacimiento", dijo Saturno este martes en una teleconferencia. "Es como conocer solamente el arte moderno y después encontrar sorpresivamente el dedo de Dios tocando la mano de Adán", agregó. El muro (de 9 metros x 90 centímetros) muestra una escena que recrea el nacimiento, la muerte y la resurrección del hijo del dios del maíz, retratado en cuatro ocasiones con diferentes animales, ofreciendo un sacrificio de sangre de sus genitales. Primero aparece en el agua con un pez, en tierra con un venado, en el aire con un pavo y finalmente en un paraíso de flores. El flamante rey maya está retratado al final del mural. "La coronación es del mismo estilo de la ceremonia que tuvo lugar durante el periodo maya clásico", entre los 600-700 dC, dijo Saturno: "se ve la misma corona en los siguientes 800 años". Coloreados con tonos azules grisáceos, naranja y tonalidades color carne, los diseños de la pared oeste sugieren que se trata del centro de una habitación, probablemente utilizada como un sitio de preparación para las ofrendas reales. Mónica Pellecer, una arqueóloga de Guatemala que colabora con Saturno en la Sociedad Nacional Geográfica que patrocina la expedición, excavó este año la primera tumba conocida de los reyes mayas, justo a unos metros del mural. Ella descubrió los huesos de un hombre con una placa de jade alrededor de su cuello, símbolo de la realeza maya. Los huesos -que datan de 150 años antes de Cristo- estaban rodeados de siete vasijas, incluyendo una con la imagen de Chac, dios maya de la lluvia. Saturno detalló que San Bartolo es más antiguo que las famosas ruinas de Tikal, pero en su apogeo se asemejaban en el tamaño. "Seguimos encontrando nuevas sorpresas en San Bartolo", agregó Salvador López, director de monumentos mayas del ministerio de Cultura de Guatemala. "Vamos a asegurar su preservación para las futuras generaciones". Estas pinturas son "una obra maestra del antiguo arte maya y abren una nueva ventana sobre el alba misma de esta civilización", explicó durante la teleconferencia el director del proyecto, William Saturno, profesor de la Universidad de New Hampshire y experto del Museo de Arqueología y Etnología Peabody de Harvard. Algunas partes del fresco parecen haber sido pintadas la víspera, se maravilló Saturno, insistiendo en el extraordinario estado en el que se conservaron estas obras policromáticas. Reiteró que "la calidad de estas pinturas muestra que los antiguos mayas trabajaron con un alto grado de sofisticación y elegancia mucho antes que las obras del periodo clásico de esta civilización en el siglo VII". A pesar de haberse realizado mil 500 años después de los murales de San Bartolo, el código Dresde (que se encuentra en Alemania), uno de los cuatro documentos importantes de la época maya que sobrevivieron, contiene secuencias similares a las pinturas, por ejemplo, sobre los sacrificios ofrecidos a los dioses. No obstante, los signos utilizados en la escritura jeroglífica en San Bartolo son difíciles de leer, explicó en un comunicado David Stuart, profesor de arte y escrituras mesoamericanas en la Universidad de Texas. El proyecto arqueológico de San Bartolo comenzó hace cinco años y se encuentra actualmente en la mitad del camino, señaló Saturno. Las primeras piezas arqueológicas encontradas en una tumba real en las ruinas Mayas de San Bartolo, Petén son exhibidas por las autoridades del Instituto de Antropología e Historia. Según los investigadores estos vestigios muestran que la sociedad Maya era muy avanzada para su época. Las piezas arqueológicas encontradas en la tumba real fueron elaboradas 160 años antes de cristo y marcan un nuevo indicio sobre como los Mayas conformaron una sociedad avanzada. Según explicó la arqueóloga y coordinadora del proyecto arqueológico de San Bartolo, Monica Urquizu, la tumba muestra que en esa época temprana ya existía una sociedad totalmente desarrollada y compleja. No estaba en sus inicios o probando formar una sociedad como se ha encontrado en otras épocas. "Había dirigentes que se encargaban de la planificación de la vida, de la sociedad y de la construcción de comercios y ciudades etc. ", expresó. La tumba pertenece a una persona importante como un rey, en su interior se localizaron vasijas, figurillas de piedra verde y cuentas de jade, pero según Irquizu lo más importante es una vasija que habla del Dios del Maíz, el cual es un elemento importante (el maíz) en la ideología Maya, a demás ha perdurado por los siglos hasta hoy. La exhibición montada muestra una réplica exacta de la tumba real y el conjunto de murales descubierto en San Bartolo, Petén (a ocho kilómetros del sitio arqueológico Xultún en la cuena del río Ixcán, Petén. La pirámide de las pinturas del sitio arqueológico fue descubierta en el año 2001 y la particularidad que tiene en su interior son frisos con pinturas murales que describen la creación del mundo según la cosmovisión Maya.